All the programs available on the AVS4YOU.com website are shareware and require activation. It means that you can use any of the programs right after downloading and installing it. There is no feature or time limitations for them, the only limitation is our watermark banner that is included into all output files. If you'd like to get rid of it, you should activate the programs. One can activate the AVS4YOU software only after purchasing a subscription. On our website two subscription types are offered. After acquiring one of them on the Buy Now page you'll receive an e-mail from us, where you can find some instructions for installing and activating the AVS4YOU programs and your personal license key. 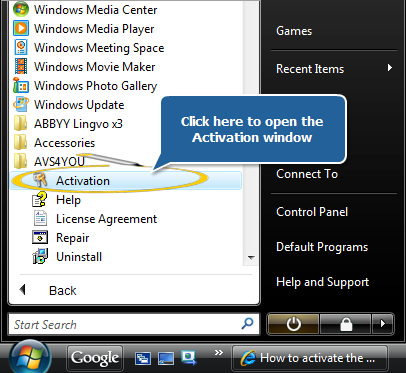 With this license key you are able to activate any of the downloaded AVS4YOU programs. Once you activate one of them, all other AVS4YOU programs will automatically get activated. Normally the programs remain activated, till your license expires (if you purchased a one year subscription). 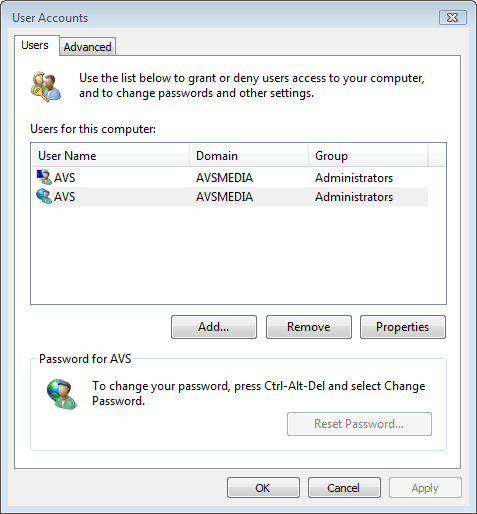 In some cases, e. g. by changing the configuration of your personal computer or after transferring the AVS4YOU programs to another PC, the programs can become unactivated. These situations won't be considered within this guide. If you face the activation problem in similar cases, you should contact our support staff that is always willing to help you via the support form. Some of our users experience problems activating the software for the first time and this guide is meant to help first of all them. The detailed information about downloading and installing the AVS4YOU programs can be found in the How to download and install the AVS4YOU software on your PC? guide. Please, make sure that you logged on at your computer as administrator. 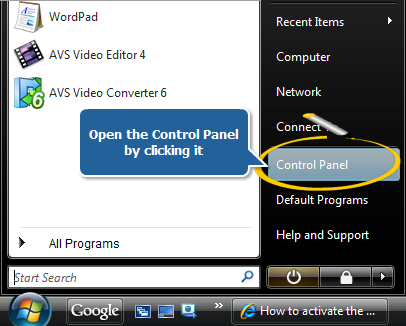 To do that, please open the Start menu in the lower left-hand corner of your desktop, select Control Panel >> User Accounts . At the Users tab find your user name in the corresponding column and check, if there is the Administrator status against your name. Please, also verify your Internet connection that is necessary to activate the AVS4YOU programs. Besides it's recommended to include AVS4YOU into the exception list of your anti-virus and firewall software. If you don't know how to do that, you should disable it for the moment of activation. Please, DO NOT FORGET to enable the anti-virus and firewall programs after activating the AVS4YOU software. The license key you need to activate the program can be found in the registration e-mail that was sent to you after purchasing the subscription. If you lost it, you can retrieve your key by using our quick license retrieval system. 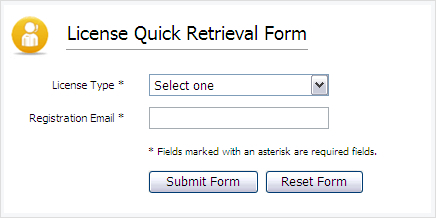 In the license quick retrieval form you should select the subscription type (one year subscription or unlimited one), enter the e-mail address you used for registration and press the Submit Form button. An e-mail containing your license key will be automatically sent to the entered address. If you still can't find the license key, contact our support team via the support form. Note: After upgrading to Windows 8, the Activation tile may not be represented on the new Start screen. To access it, please right-click on any blank area of the screen, then click the All apps button in the lower right-hand corner of the screen. All the programs installed on your PC will be displayed on the Apps screen. The Activation item can be found in the AVS4YOU section. In AVS DVD Copy press the Activate link at the bottom of the program window. First of all no message window will appear by starting the program, thanking for evaluating the AVS4YOU software. Then you won't see the non-activated caption on the main program window any more. It was changed to the software version number. And finally no watermark banner will be placed into your output files.